Do the numbers 808.81, 811 or 821 ring a bell? We've been hitting the library stacks this month in celebration of National Poetry Month and have become quite familiar with the books in these Dewey Decimal system sections. I'm rather ashamed to admit that before this past month, we hadn't checked out any of the offerings in this part of the library. But, blogging does have a way of broadening your horizons in delightful ways. We've read some beautiful, lyrical, funny and all around amazing children's poetry that we never knew existed. And the best part? The kids love it. Now I am by no means a poetry expert. This month has been about baby steps for both the kids and me. In fact, I did not particularly like the poetry lessons in school. The word poetry leaves me trembling and feeling a little intimidated. But, that's mostly because in school I was required to write verses as instructed and work to interpret meaning in poetry. (Read J. Patrick Lewis' "Can Children’s Poetry Matter?" for more on this topic.) My perspective completely changed when I started reading poetry for my own personal entertainment. Likewise, young children should be able to freely choose and seek out poetry, much like they would any other form of entertainment. What poetry books do you have in your home? If you want your children to immerse themselves in the verses they must first have access to poems. Before my children were born, I purchased a volume of Mother Goose rhymes. One of the best purchases I've ever made. I still sing nursery rhymes with them daily. But, there's a whole lot more out there...volumes and volumes just waiting to be discovered by little hands. Today, as part of the Savvy Verse & Wit National Poetry Month Blog Tour, I'm writing about a few read aloud poetry books for young children we discovered and, in some cases, eventually purchased for our home library. 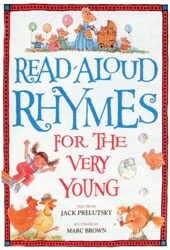 We started out our poetry month with a superb collection of poems -- Read-Aloud Rhymes for the Very Young by Jack Prelutsky. The first poet to serve as the U.S. Children's Poet Laureate (2006-2008), Prelutsky is a super star in the world of children's poetry. His anthology is packed with over 200 poems that were specifically selected to appeal to the youngest children, baby to age six. Sun up to sun down, the poems in the book cover a variety of child-friendly topics ready to spark the imagination -- the seasons, animals, imaginary creatures, outdoor exploration and personal feelings. Some are familiar (like "I See The Moon") but many are not and some are just plain silly. Nearly every poem is accompanied by one of Marc Brown's fun illustrations. 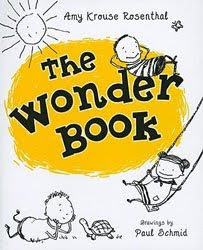 What I really like about the book is that it's a perfect launch pad for exploring the children's poetry world. With so many poets featured, it's like a who's who book of kid friendly poets. My daughter's favorite poems so far (we haven't read them all) include, "When All the World's Asleep" by Anita E. Posey and "Birthdays" by Mary Ann Hoberman. And all the songs you'd hear..."
Speaking of Mary Ann Hoberman, she's the current Children's Poet Laureate. She calls herself the Pied Piper for children's poetry. While she has written some awesome poetry books (For example: The Llama Who Had No Pajama : 100 favorite poems), she's also a good example of an author that has an extraordinary talent for writing lyrical picture books. That's right, don't only canvas the nonfiction shelves...many picture books contain poetic elements. One such book my daughter picks up again and again is All Kinds of Families! 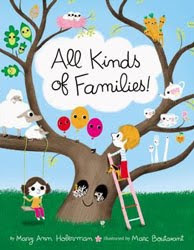 Through rhyming verse, Hoberman gives examples of all sorts of families and groupings and get kids thinking about families around them. Thimbles, toes, seashells and toothbrushes over the sink all are considered families, just like families of people. Impressively illustrated by Marc Boutavant in a retro and unique sort of way, the pictures are as equally enchanting as the text. There's a lot to think about while reading this book, and it also lends itself to discussions about family trees, birth, and what makes a family. This book has left its spot among the family of books on our shelf multiple times! The keys on a piano or stamps in the mail"
"Stop That! Be Quiet! Please Sit Still" captures the energy of a young child and the desperate plea of parents. The ending surprises. "A Man, a Plan, a Canal...Palindromes" consists of several creative palindromes. Our favorite? "The mall llama!" "Half Birthday" made us think that we should all celebrate our half birthdays...or then again maybe not. And our very favorite - "The Less Famous Friends of Mary Mack" - You know Mary Mack, the girl in black? Apparently she has friends in yellow, blue, red, white and pink. In the sink sink sink"
The book is all about silliness and is such fun to read aloud to preschoolers on up or browse in bits by yourself. Even the index is hilarious. I wonder why it has to end so quickly and wish it was longer! Back in the beginning of April, my preschool daughter decided it might be fun to create her own "My Poetry Book." Nearly every weekday this month, she has selected a poem, copied and pasted it into her book and drawn a corresponding illustration. Here's her newest entry, in time for National Arbor Day today. She made a "POET-TREE" by cutting the stanzas of a poem into leaf shapes and attaching them to a tree. (Idea inspired by Fancy Nancy: Poet Extraordinaire!) The tree poem she picked is "Open House" by Aileen Fisher. Please share your favorite read aloud poetry books with us...we're always open to suggestions! And be sure to check out the other posts in this month's Poetry Blog Tour (and vote for your favorite post) or join in the fun by participating in today's Poetry Friday or today's Feed Me Books Friday. This is a wonderful post and I'm glad that kids are enjoying poetry! I love the POET-TREE! That is so creative. Wonderful. Thanks for participating in the National Poetry Month Blog Tour. Please remember to add your link to Mr. Linky and to send your link to Susan at Winabook. Also, today is the day that voting begins for favorite posts of the month. Bummed that I can't find my Silverstein- must be tucked away in my old teaching belongings! Thanks for the inpiration! Will need to check out some of your suggestions from the library. When my youngest was little, one of his favorite books (now sadly out of print, I think) was How Many Tow Trucks Can a Tow Truck Tow, which was one giant tongue-twisting, rollicking rhyme. I still have parts of it memorized after reading it several billion times! 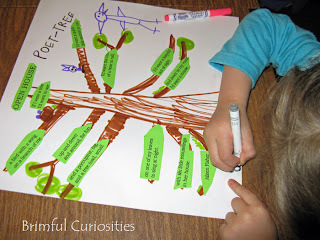 I wish I had read about the poet-tree when my kids were younger (the youngest is 9). We enjoyed poetry more often together when they were little. I'll have to think of some way to get them engaged into it again (the older two are almost 15 and almost 12). Great suggestions. We really need to read more poetry! Great post! I love the poet-tree! Your daughter has a great imaginations. What a cool idea! Thanks for the e-mail. I've got this posted at Win a Book for you. Kid's poetry is great! I agree that I haven't been too fond of poetry due to my experiences with it in high school. But I'm discovering it's beauty right alongside my girls. These sound like great collections. I love Jack Prelutsky. My first book of poetry was New Kid On The Block by him. how adorable! i love how your daughter illustrated the poem...so cute! i'll have to remember this for my kids! I LOVE the POET-TREE. What a terrific idea! I was just thinking I needed to look into some poetry books! Thank you for doing my homework. Excited to look into these! What a delightful post! It is so easy to be bit by the poetry bug. I hope your reading will soon make you a permanent citizen of the poetry world--a world older than the poems in the Bible. This is a great post. Thanks for linking me up to it! I love the idea of the "poet-tree," too!